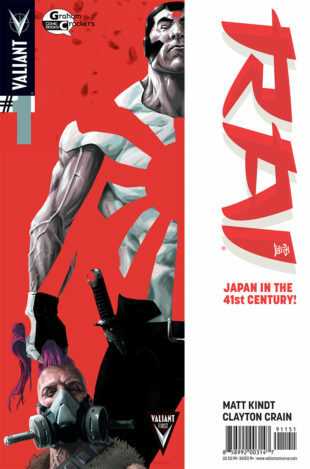 VALIANT Announces VALIANT FIRST Exclusives and Programming for C2E2 2014 – With RAI, ARMOR HUNTERS, and More! From April 25th-27th, Valiant will be unleashing a calvacade of VALIANT FIRST news and exclusives direct from C2E2 2014 – Chicago’s premier comics and pop culture convention! Join Valiant at Booth #317 for a weekend packed with signings from Valiant creators, including artist Clayton Henry (Harbinger, Archer & Armstrong), writer Justin Jordan (Shadowman, X-O Manowar #25), colorist Brian Reber (Unity, X-O Manowar), and more surprise guests! Plus, look for a ton of free giveaways and con-exclusive products, including the RAI #1 Graham Crackers Shared Exclusive Variant by fan favorite artist Kalman Andrasofszky (X-23)! Then, join us on Sunday, April 27th at 2:30 PM in Room #S403 for the VALIANT FIRST: RAI, ARMOR HUNTERS, AND BEYOND panel presentation! The coming of VALIANT FIRST begins at C2E2 with an all-new round of news, announcements, artwork and Q&A about the most in-demand publishing company in comics today. What do you read FIRST? All summer long, Valiant will be rocketing to the top of your read pile with VALIANT FIRST – an all-new initiative unleashing a major #1 issue by some of the most talented creators in comics each month from May onward. With the earth-shaking events of ARMOR HUNTERS – Valiant’s colossal summer crossover event – just weeks away, get the inside track on what happens next for X-O MANOWAR, UNITY, BLOODSHOT, HARBINGER, and more from an all-star panel of Valiant creators and staff, including writer Joe Harris (Armor Hunters: Bloodshot), artist Clayton Henry (Harbinger, Archer & Armstrong), colorist Brian Reber (Unity, X-O Manowar), Executive Editor Warren Simons, and Chief Creative Officer Dinesh Shamdasani. For more information on C2E2, visit C2E2.com.